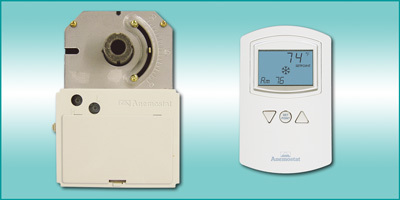 Anemostat’s Model C51 analog controller is used in air flow strategies to provide pressure independent control with analog voltage signals that provide closed loop control of air flow and auxiliary heating devices such as hot water or electric coils. Air flow adjustments are made at the space thermostat, reducing the time required for flow trimming. Anemostat includes the space thermostat (factory calibrated for design flow) where applicable when analog controls are provided. The Model C51 controller requires a 24vac power source. Typically, a step down transformer is used at each terminal. Electronic input signals such as air velocity and room temperature are processed by the controller. The Velocity Wing inlet sensor provides the controller with signals representing actual flow rate. The integral reversible damper actuator responds as commanded by the controller for flow regulation. The included wall thermostat provides feedback to the terminal controls, signaling requests to meet temperature setpoint.